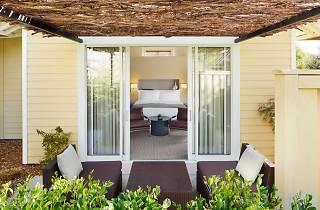 Solage Calistoga, an Auberge resort, is located in the far northern Napa Valley town of Calistoga, famous for its quirky culture and mud baths. This luxurious escape offers guests spacious and comfortable rooms, a casual (and relatively affordable) Michelin-starred restaurant, unique spa experiences (including mud and mineral water therapies) and complimentary bikes to cruise the surrounding hillsides. 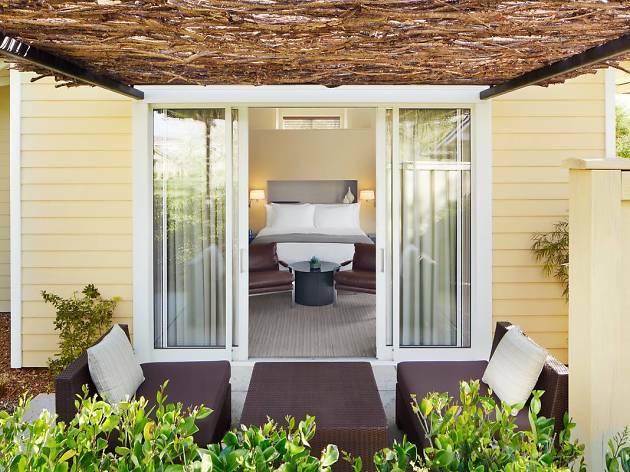 Calistoga is the hottest part of Napa, so the enormous pool is a highlight of this property. In addition to the numerous wineries near the hotel, the nearby Napa Valley State Park offers beautiful hiking trails. The hotel also offers a yoga and wellness studio with complimentary classes, bocce ball courts, and special pet beds.